The archaeological site of Newgrange is one of the finest tombs in Europe known as a passage grave and was constructed ~3000 BC and is ~5000 years old and predates the pyramids! 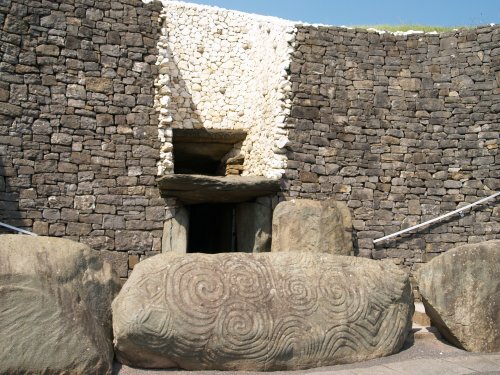 You first see the white-stoned facade of the Newgrange mound and some of the standing stones that seem to guard the entrance to the passage tomb complex. The 'walk-in' entrance to Newgrange and the lintel stone 'guarding' the passage and above it the false lintel through which the Sun's rays shine at the rising of the Winter Solstice Sun. 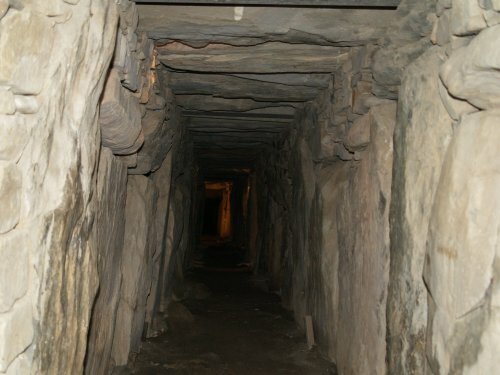 At the end of the passage is a cruciform arrangement of chambers and the winter solstice sunlight shines onto the very back wall in line with the entrance passage to the tombs. In the chambers were found great carved stone bowls containing the cremated remains of several individuals. These are burial mounds - tomb complexes, which contain cremated burials, and all surrounded by huge kerb stones, many of which are richly inscribed with elaborate mysterious geometrical designs. These kerb stones were transported some distance and the rocks used do not occur locally. Snake and spiral carvings in the kerbstone rocks. The stone lined eastern passage grave entrance, still standing true after ~5000 years!